It's good to set achievable goals on a regular basis, because pulling them off always gives you such a lift and let's face it: there's a lot of stuff in the world that serves to do the opposite. Crafting goals are the best of all, because when you achieve them you get a lift and a nice finished thing to show for it. This time last year, I decided I wanted to learn to crochet before the next January rolled around. It's a good thing I didn't go further and decide I wanted to crochet an actual Thing, because I did learn to crochet, and got in lots of practise even though I didn't make anything in the end. Maybe this year - and let's be clear, that's not a goal, just a bonus if it happens. Nope, this year I have one simple, achievable dream. 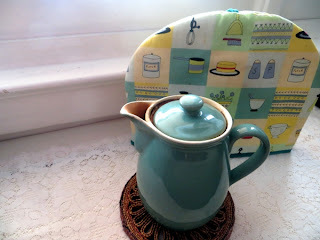 I want to make a cosy for my teapot that doesn't include the handle or the lid. This pot is an old green Denby, bought at a boot sale in 1989 when I was living in England. I love it and I use it every day at home - it's an enormous part of my life, and the cheery sound of the lid fitting into place when the hot water's been poured over the tea to steep is just the best thing ever. A few years back my cousin sent me that adorable cloth cosy for it, and it's perfect, except that lately, I've put it over the pot for the steeping only to burn my hand when I pour out the first cup. Bleh. The obvious solution is to knit a little vest for the pot, leaving the handle free. We're talking about a K1, P1 tube with a gap, nothing glam or complicated. That would take care of the steeping, and I can always slip the larger cosy over top after the first pour - because sometimes I come back 90 minutes later hoping for a second or third cup without having to brew all over again. Yep, I drink a lot of lukewarm tea. What colour? Do I match the pot, or the kitchen? Do I care about staining? What yarn can I spare from the stash for this purpose? What fiber, come to that? All my favourite ideas are fluffy, and will the fiber fly off and drift into my tea? I've been agonizing about all this for at least three months, with at least a year of lesser anxiety trailing off before that. Well, this is it. In 2014, I am going to knit a tea cosy for my coffee shaped pot, even if it's just a temporary one in some colour that clashes horribly with it. What's your knitting goal for 2014? I did make one of my goals for last year, I learned to make socks.. only made one pair, hope to have time to make some that will actually fit next time!! This year my goal is to learn to crochet, I'm wondering if it would be easier on my hands than the knitting. I'm a lefty, knit right handed but not sure if I can do the same for crochet. Marianne, over the break I set aside the early socks I made because as grateful as I was for them at the time, they just aren't as comfy as the ones I made later when I got the sizing right. It does get easier! And thanks for your comment about Hugs being useful... I ask myself almost daily why I steal time from all the other stuff to write it every day and while I still don't have a practical answer, the fact that it helps somebody else is good enough!